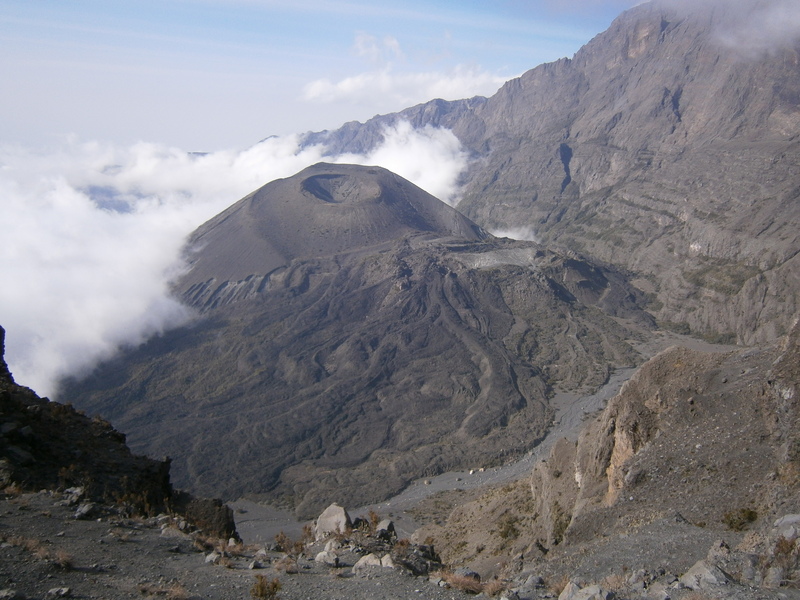 4566m Mount Meru is Tanzania’s second highest mountain, a prominent volcano near the city of Arusha. 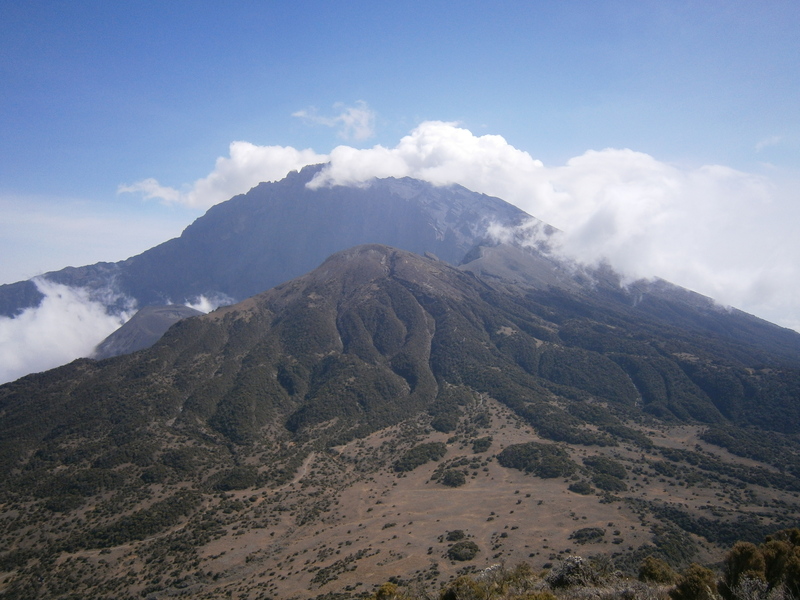 It is speculated that Mount Meru may have once been larger than Kilimanjaro, as a large eruption ~8000 years ago destroyed the eastern side of the mountain, greatly reducing its size. The volcano is still active, resulting in some interesting geographical features. 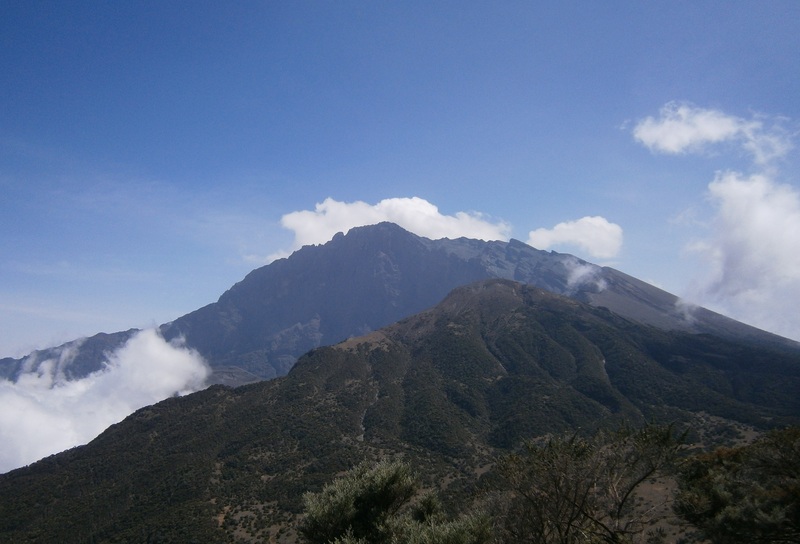 I hiked Mount Meru as a warm-up and pre-acclimatization for Kilimanjaro. A map of my route. Day 1: After a short drive to the Arusha National Park, I arrived at the Mount Meru visitor’s center. There, along with an abundance of information on local wildlife, was the above model with the various hiker’s huts marked. 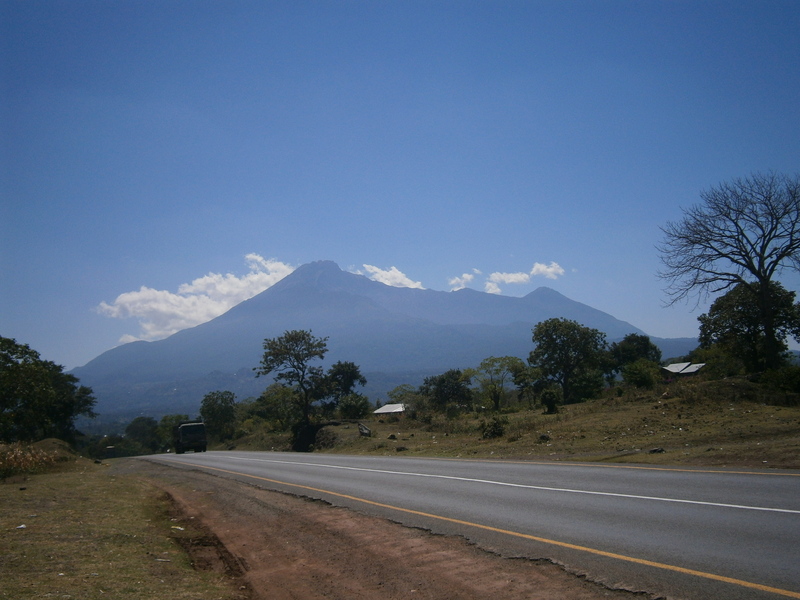 Mount Meru as seen from just outside Arusha. Mount Meru is fairly prominent, and can be clearly seen from the city of Arusha. The park ranger, armed with a rifle. 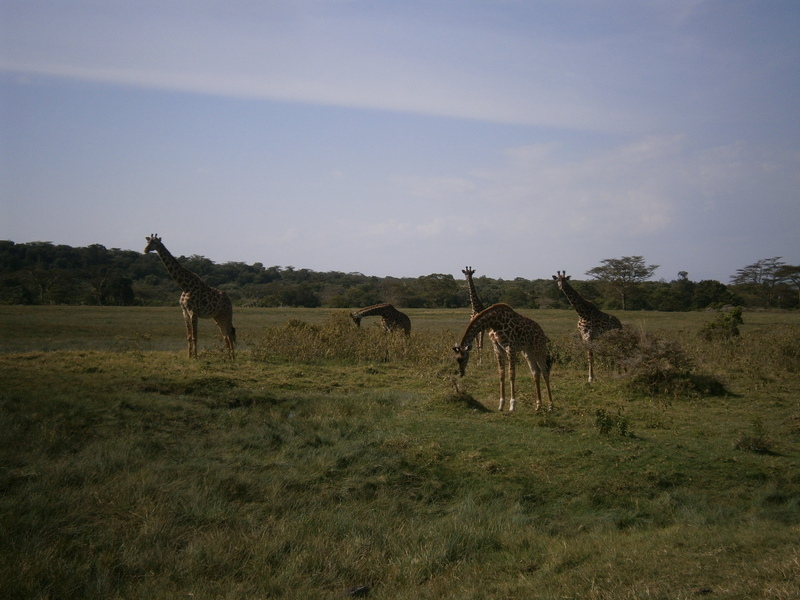 One interesting aspect of Meru is the considerable amount of wildlife inhabiting its lower slopes. Because of the animals, it is required that one ascend to the first hut accompanied by a park ranger, who carries a rifle. When asked, he told me that a warning shot would scare off most anything, and that he’d never had to fire on an animal before. 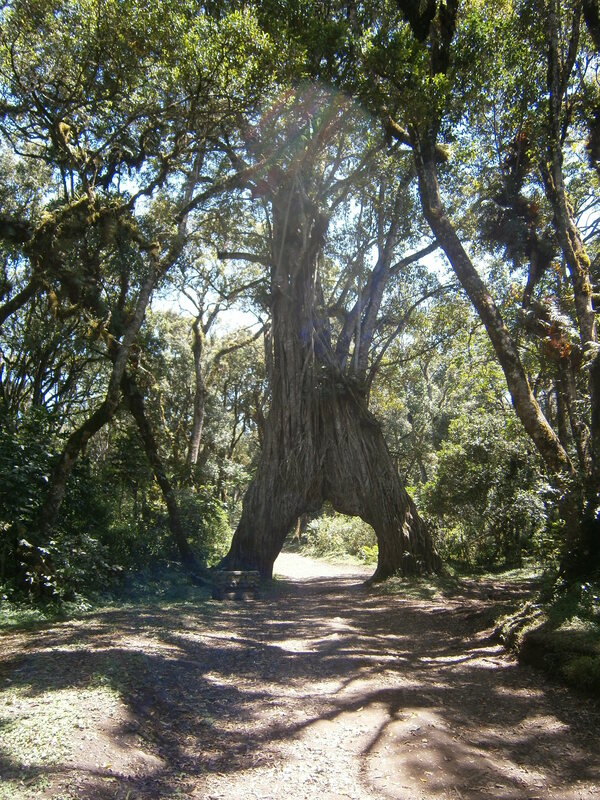 A large fig tree arches over the beginning of the lower trail. 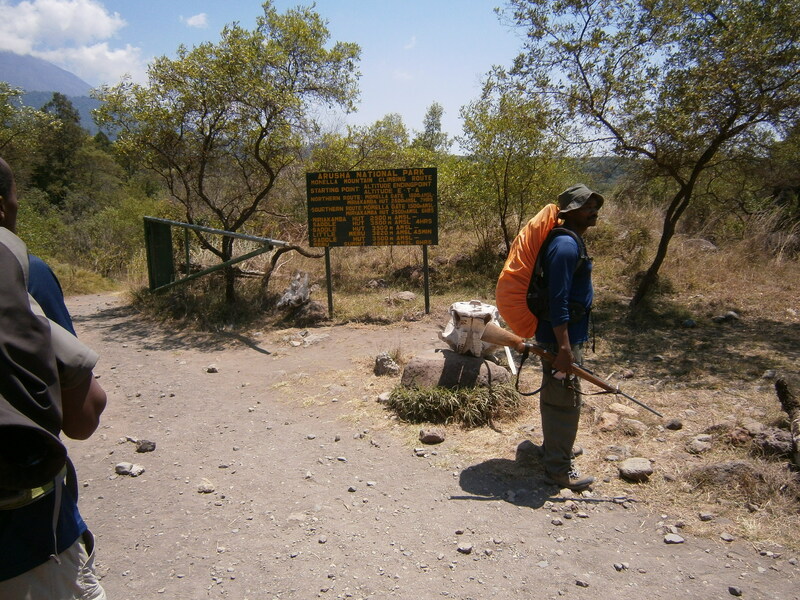 After considerable delay waiting for the park authorities, we began moving up the trail towards the first cabin at 12:30 p.m. We decided to take the long route up, which would take us through Meru’s crater. 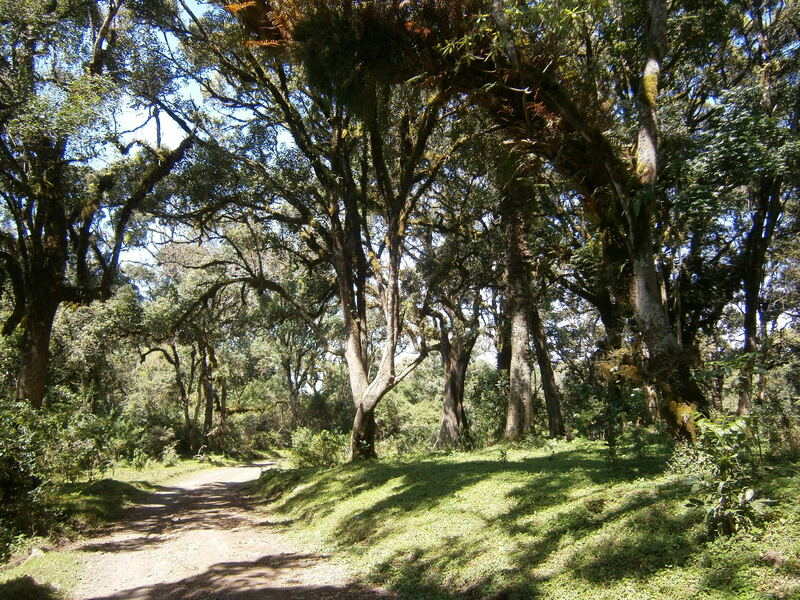 On the mountain’s lower slopes, lovely forest and grassland surrounded the trail. A small waterfall marked a lunch break. 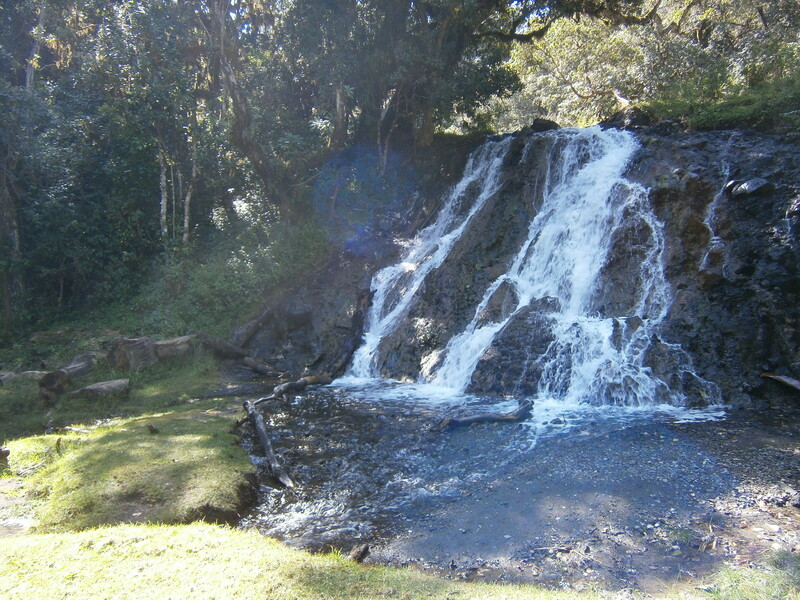 After about an hour of easy hiking over a gently sloped trail, we took a lunch break at a small waterfall. 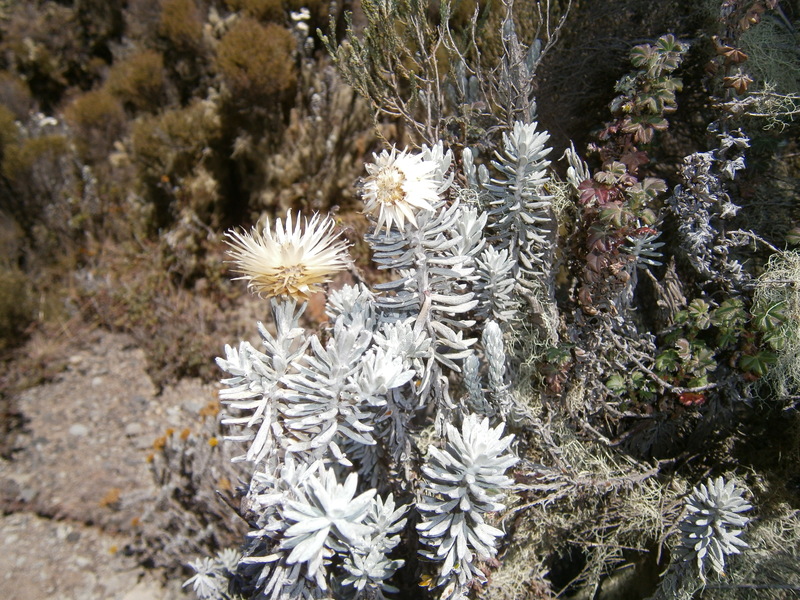 These brightly colored plants were abundant on the lower mountain, and in the crater. 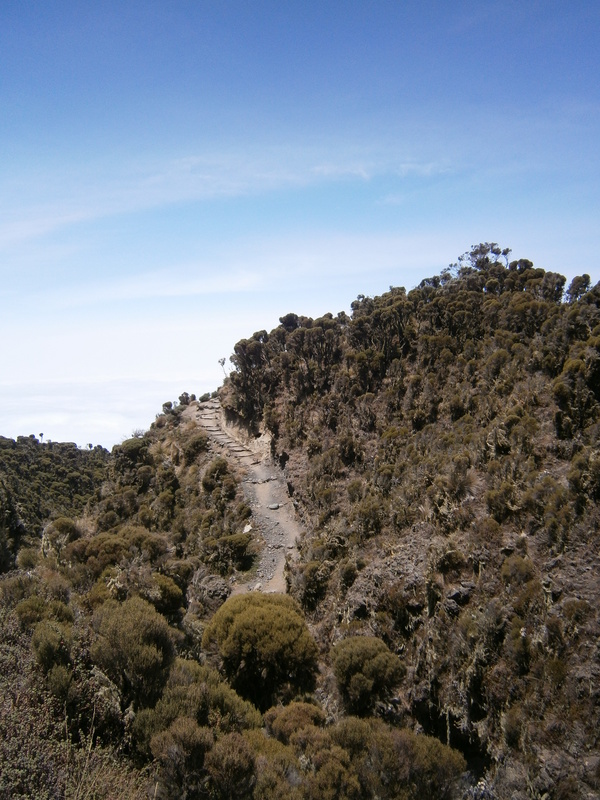 As the path continued upwards, we reached Meru’s crater. While the volcano is still considered active, it hasn’t had an eruption since 1910. 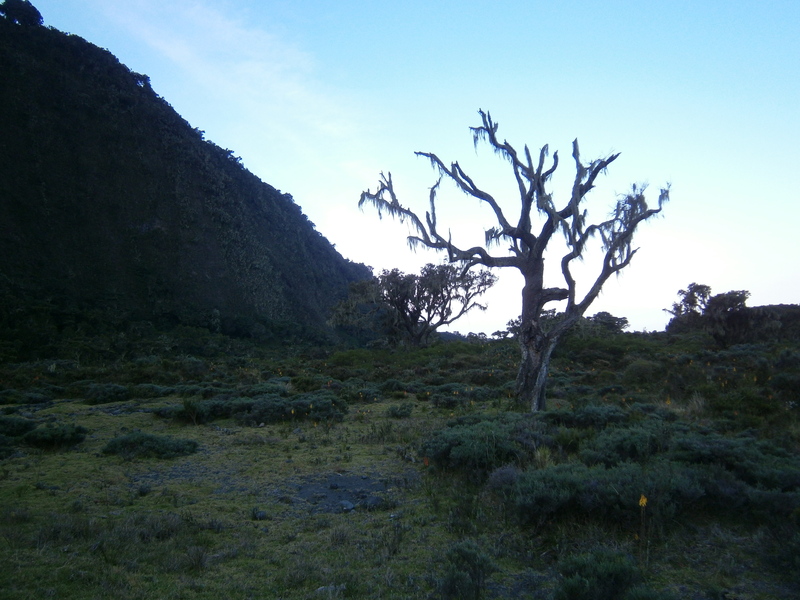 The crater is filled with vegetation, and apparently is often visited by animals. Interesting trees covered in Spanish moss dotted the crater. 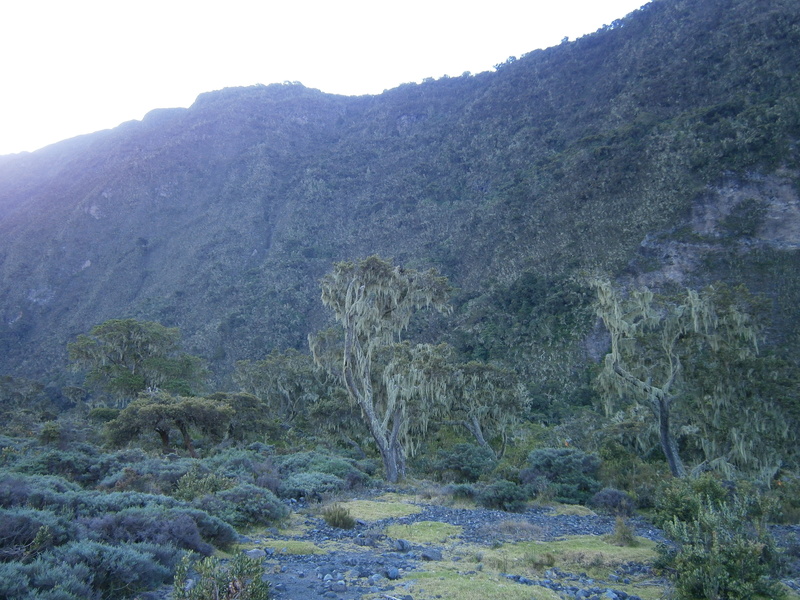 The crater walls are covered in plants and moss, creating a lush impression. 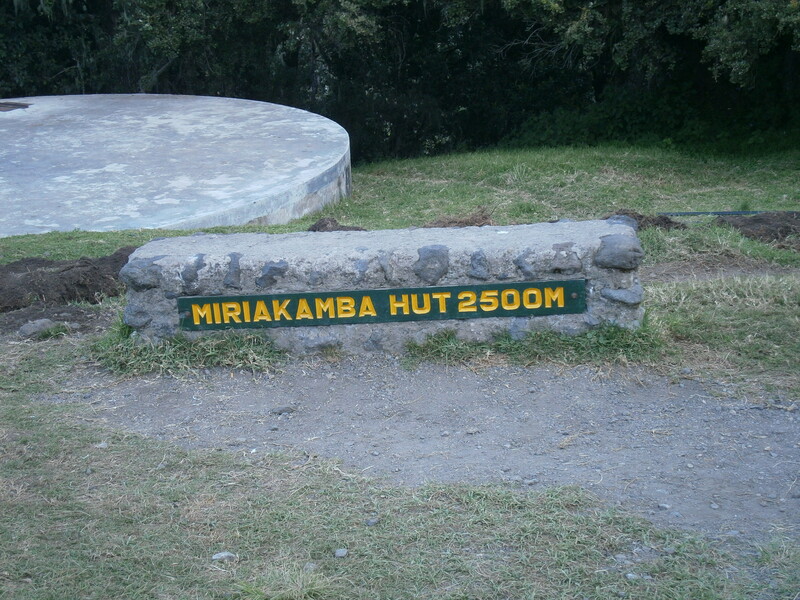 This sign marked the approach to Miriakamba Hut, the first overnight stop. Moving at a relaxed pace, we reached Miriakamba Hut, the first night’s rest point, at around 4:30 p.m. At only 2500m, and after a very short day with an incredibly late start, I was quite surprised when the Park Ranger announced we would stop for the day! The huts were basic and sturdy. There were huts for sleeping, cooking, and even a washroom. On arrival I went to the cook hut and prepared my dinner. 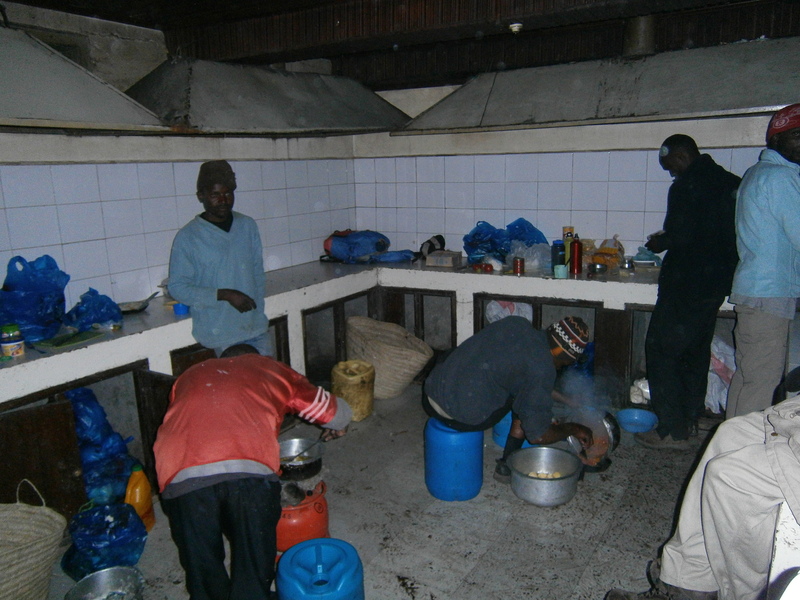 The room was crowded with porters, preparing meals for their clients. Here is where I first experienced issues with my stove, a temperamental piece of kit which would later cause much annoyance on Kilimanjaro. Fuel cells cannot be transported by air, and I was unable to bring a liquid fuel stove/bottle, so I had to source both stove and fuel in Arusha. Almost all hikers in Tanzania use porters – who carry heavy kerosine tanks for cooking – and thus portable propane/butane fuel and personal cooking gear is somewhat difficult to obtain, and of poor quality. The dorm rooms were sturdy and comfortable. The rooms were simple but comfortable. Basic mattresses were provided, and I ended up with a four-person room to myself. My cabin in the morning. Day 2: In the morning, a substantial fog had settled over everything. After cooking up some breakfast, and waiting for the park ranger, I began heading up to the next overnight, Saddle Hut at 3570m. 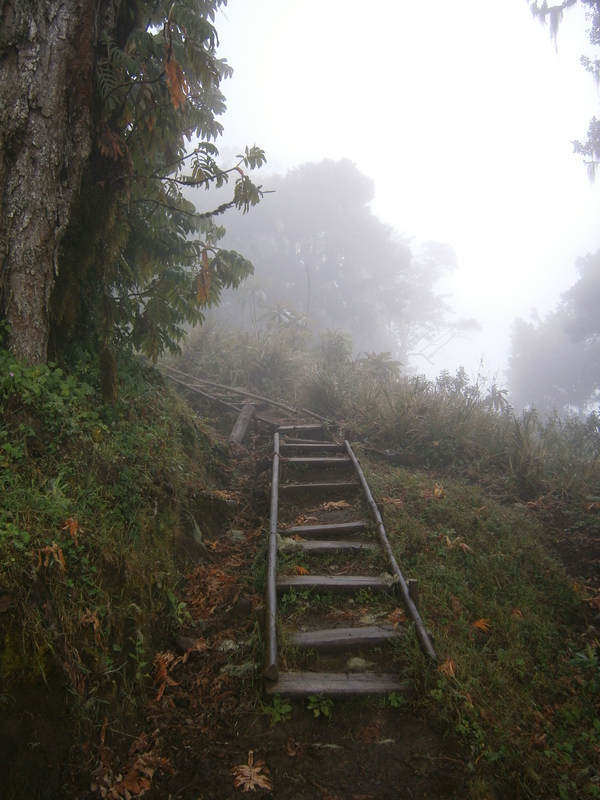 Part of the trail above Miriakamba Hut – man-made wooden staircases up the mountain. The trail remained easy and well maintained, with man-made staircases forming large portions of the path. To this point, between the clear trail and cabin lodgings it didn’t really feel like I was on a mountain at all. 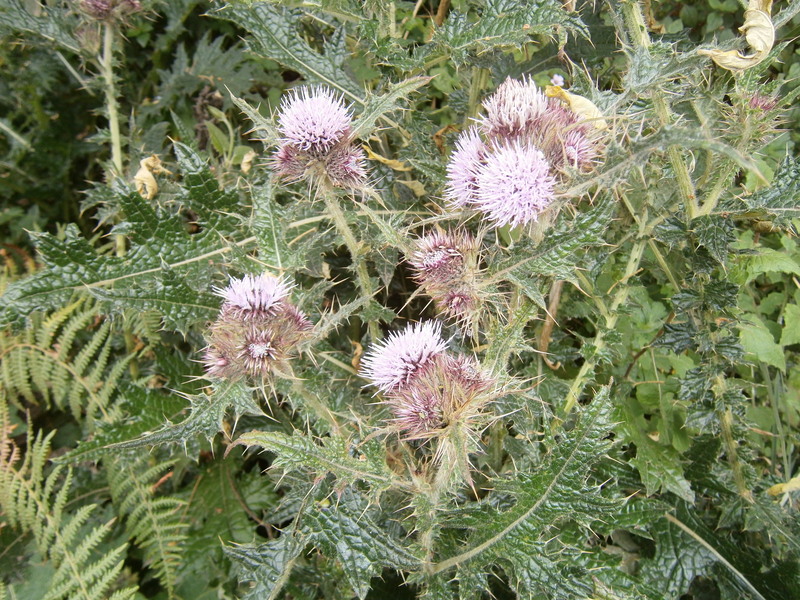 These spiny plants were everywhere, most unpleasant to step in. Mount Meru finally became visible. The fog finally lifted, and a gap in the trees granted a view of Meru’s peak. 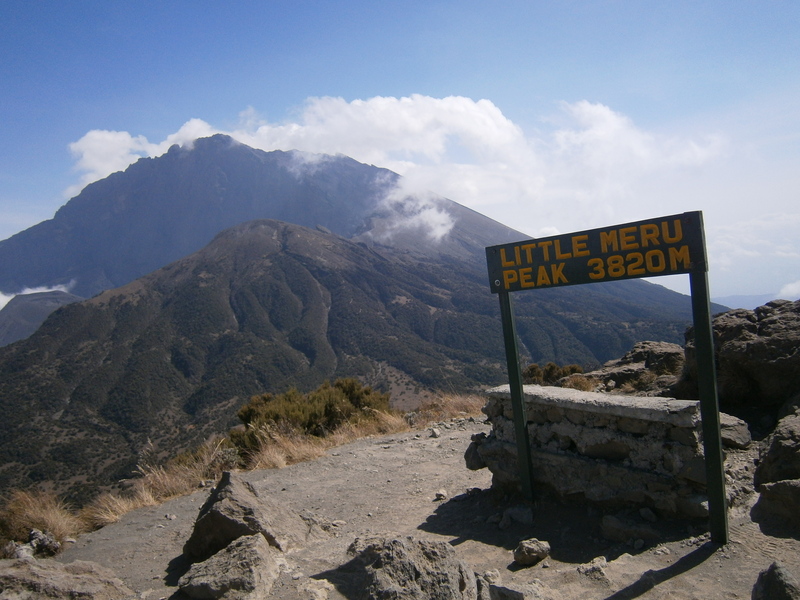 Little Meru, which rises above Saddle Hut. 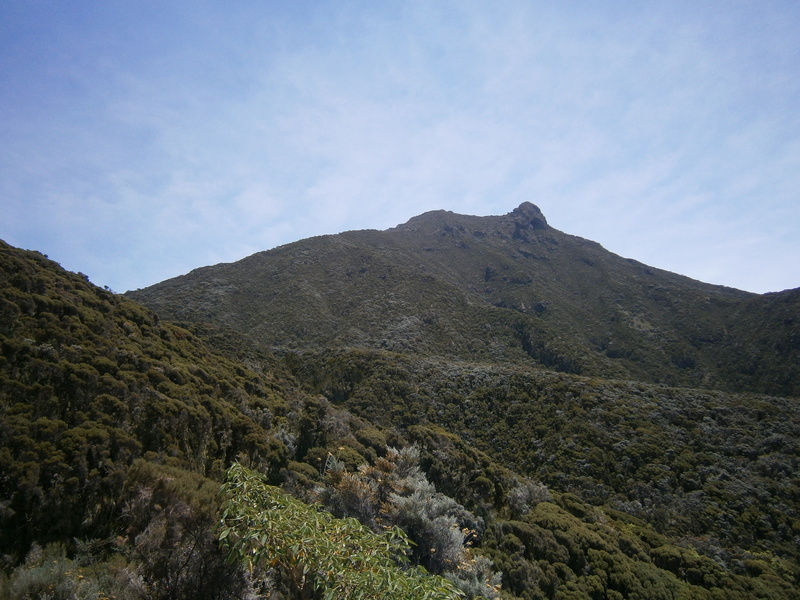 Further ahead, Mount Meru’s secondary peak, ‘Little Meru’, could be seen jutting into the sky. 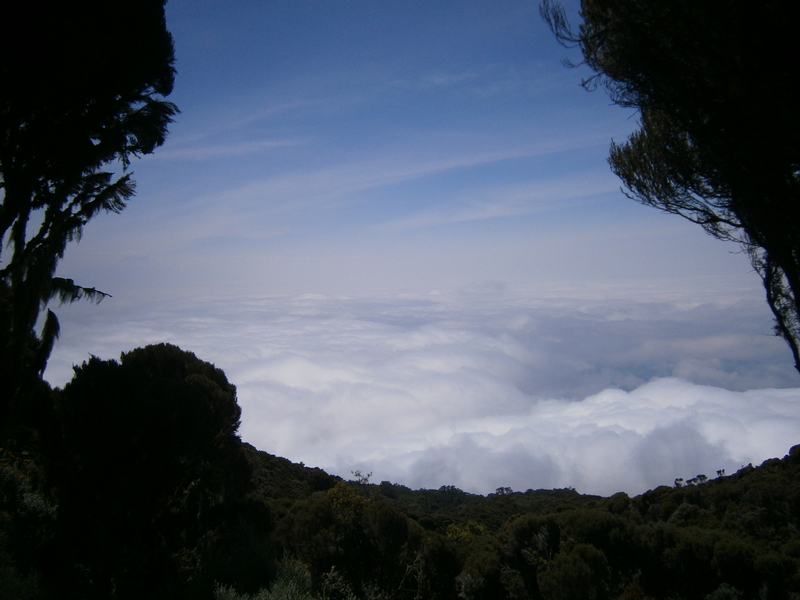 A lovely cloud ocean on the way to Saddle Hut. 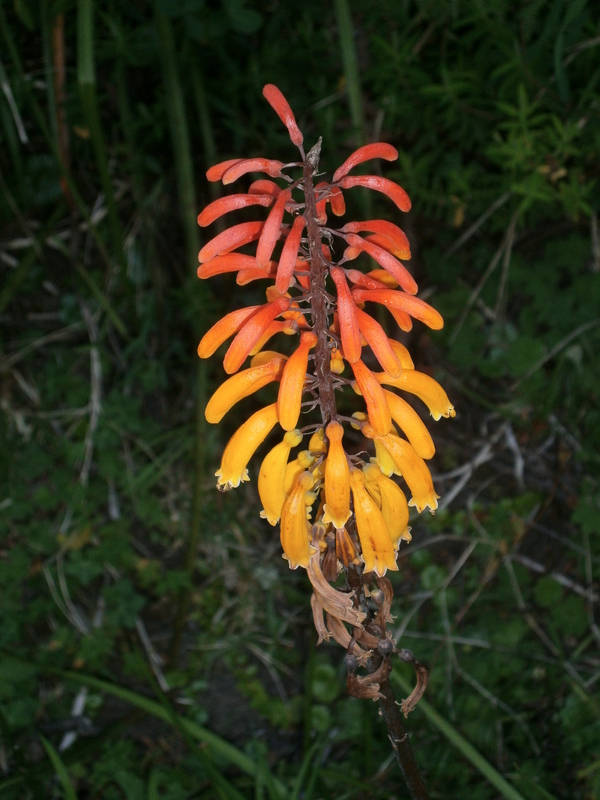 These plants began to appear in great number along the trail. I would later see fields of them on Kilimanjaro. 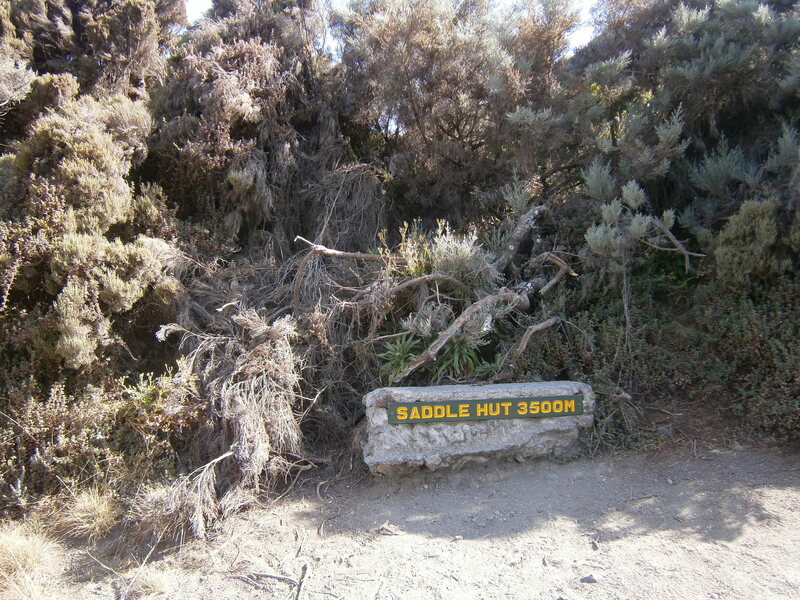 The final stretch of trail, prior to arrival at Saddle Hut. Saddle Hut, clearly signposted like everything else on Meru. 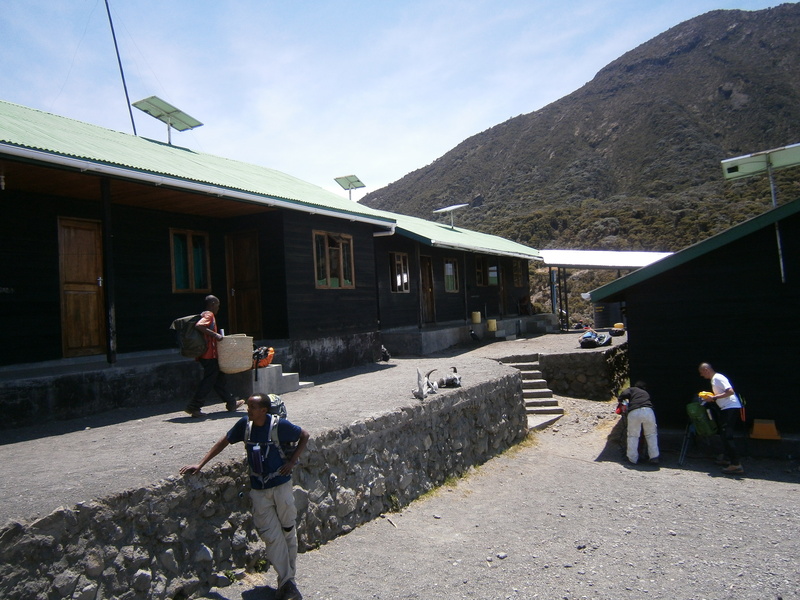 We arrived at Saddle Hut around 1 p.m. The weather was lovely and sunny, with no trace of the morning fog. Once again, the park ranger announced that the day was over. 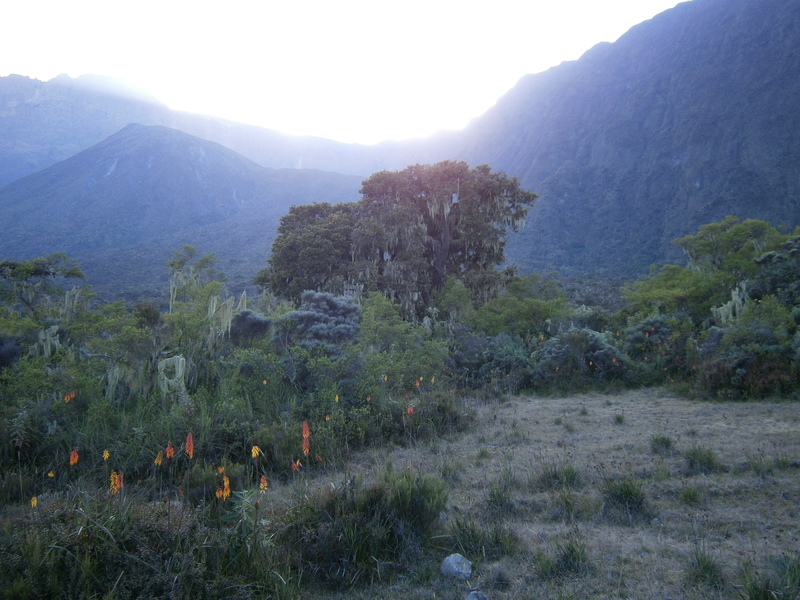 Traditionally, Meru’s summit is hiked overnight, with a ~1 a.m start. This approach to the mountain – two abnormally short days at low altitude on easy, well groomed trails, followed by one long-haul combining an overnight push to the top and a lengthy descent – doesn’t make a lot of sense. Unfortunately, schedule on Meru is inflexible, and determined entirely by the ranger. 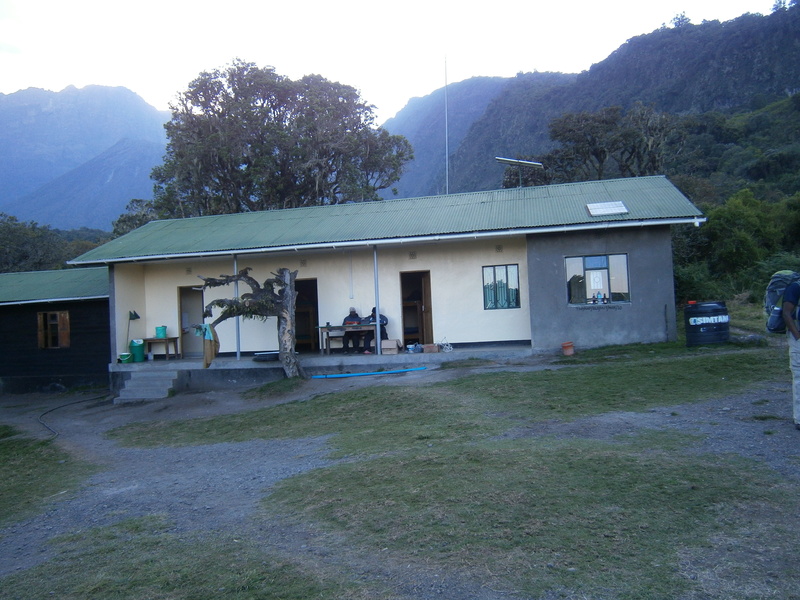 Saddle Hut, much like Miriakamba Hut, provided lodging in dorms. 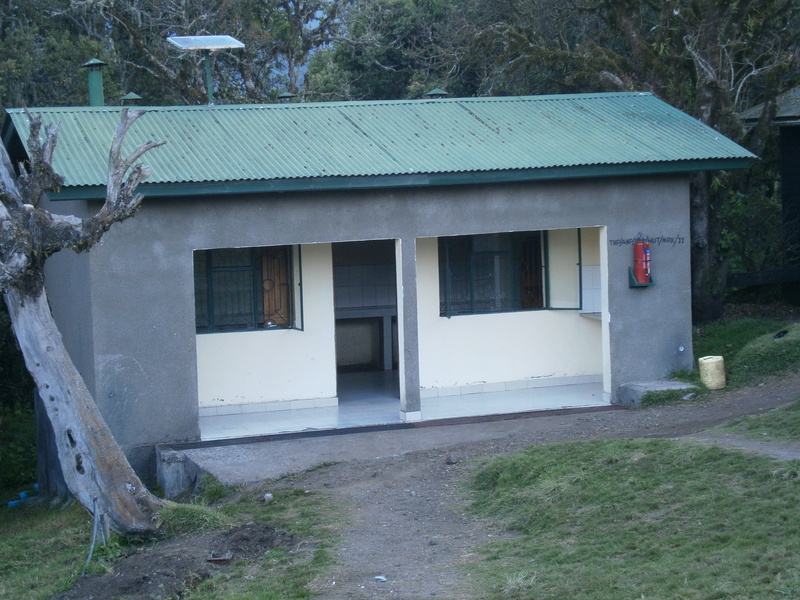 Similar in design to Miriakamba Hut, Saddle Hut consisted of a number of dormitory style bunk houses, a kitchen room, and toilets. 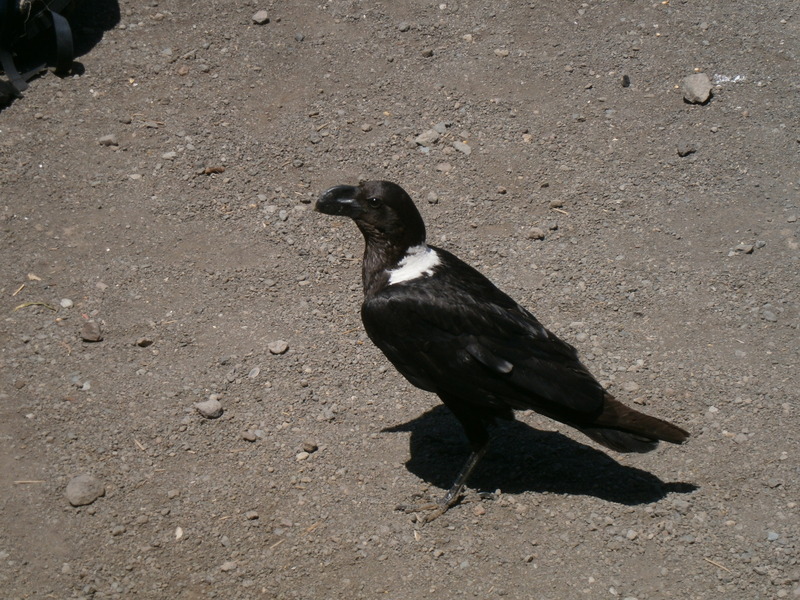 Ravens were numerous here, hunting for scraps. Saddle Hut in its entirety. 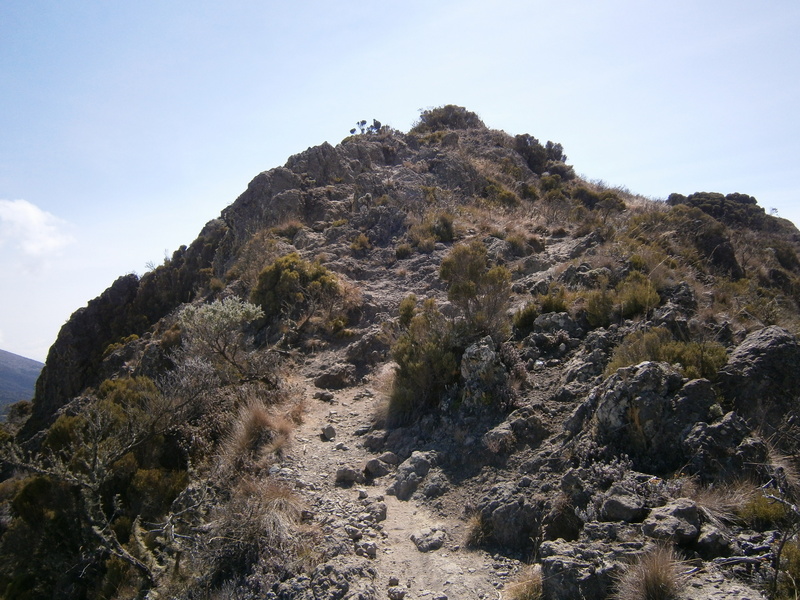 After unpacking my gear and cooking lunch, I headed up the trail towards Little Meru. 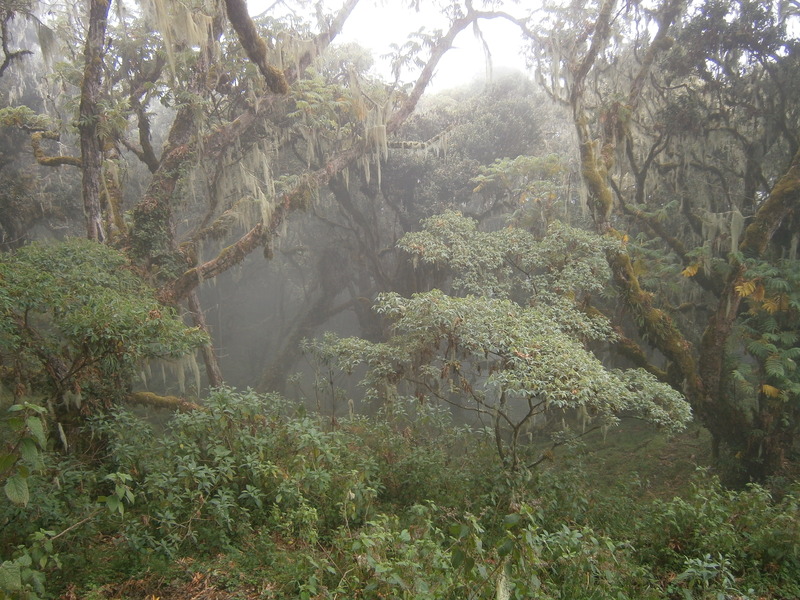 Near the top of Little Meru. 3820m Little Meru had a great view of Mount Meru’s main peak, and the route I would hike at night. 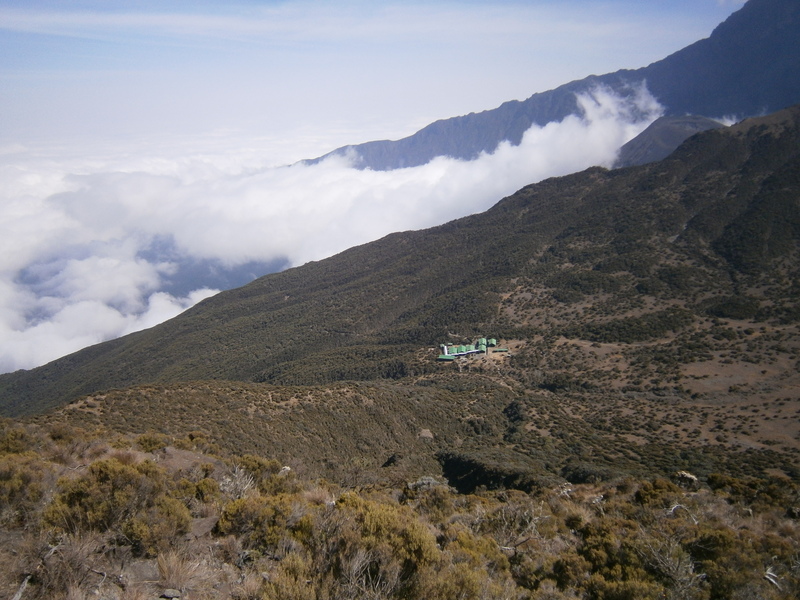 Saddle Hut, far below, from Little Meru. 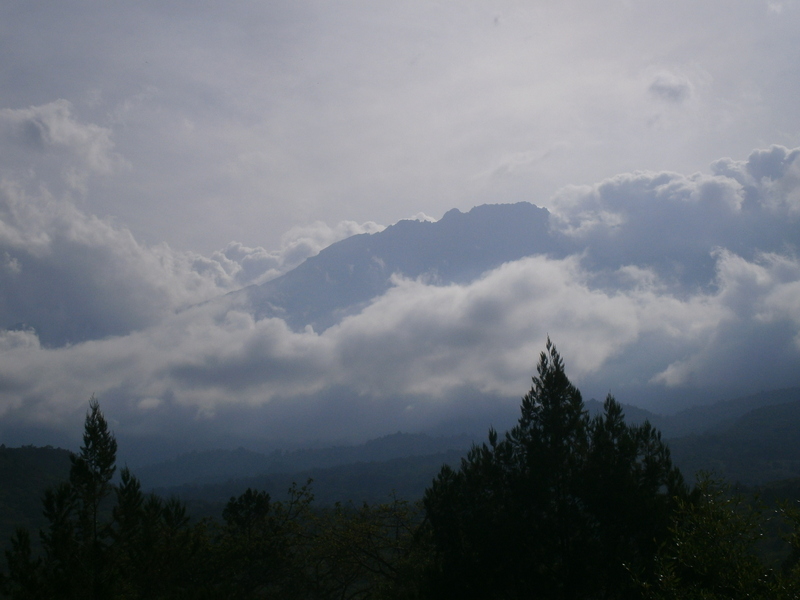 Clouds rolling over Mount Meru. Back at Saddle Hut I ate an early dinner, and went to bed around 5 p.m.
Day 2: Awake at half past midnight, and on the route up to the top of Meru at 1:30 a.m. The weather was foggy, and fairly cold due to wind. The route followed cairns and spray painted markers, the first time with no clearly defined trail. 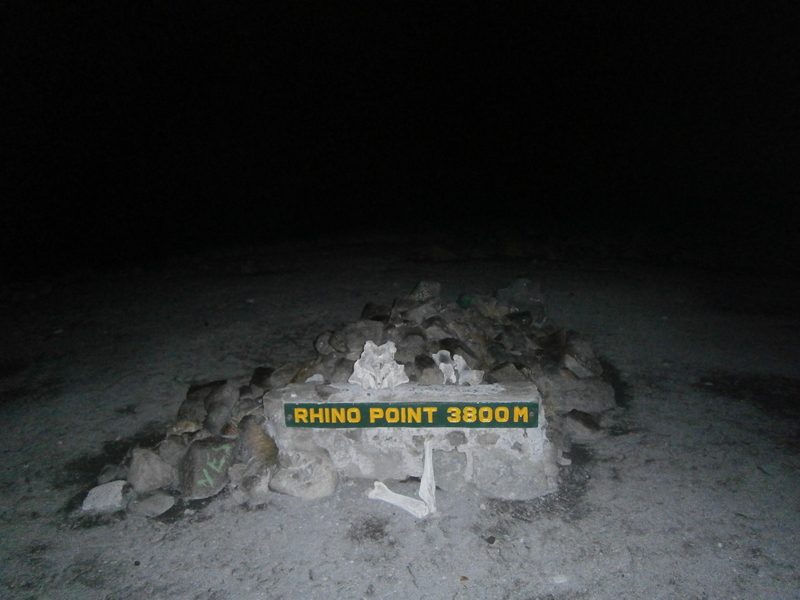 Rhino Point, a hump in the route where it is said a rhino skeleton was once uncovered. 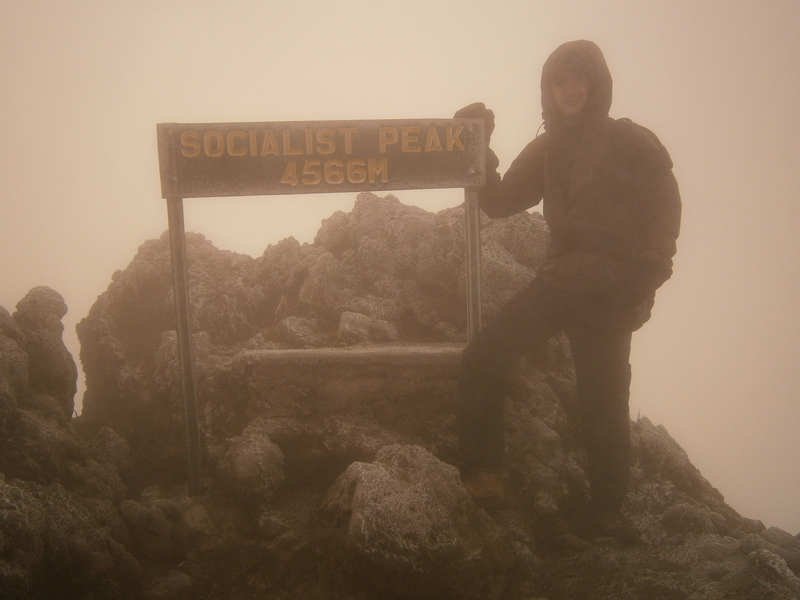 After several hours of steady progress across rough volcanic rock, I reached the summit, Socialist Peak. The morning fog obscured the views, but the sunrise created a lovely effect, glowing pinkish-orange through the cloud cover. With high winds, the mountaintop was cold and felt exposed. Looking west, where Meru slopes steeply downwards in a field of loose scree. 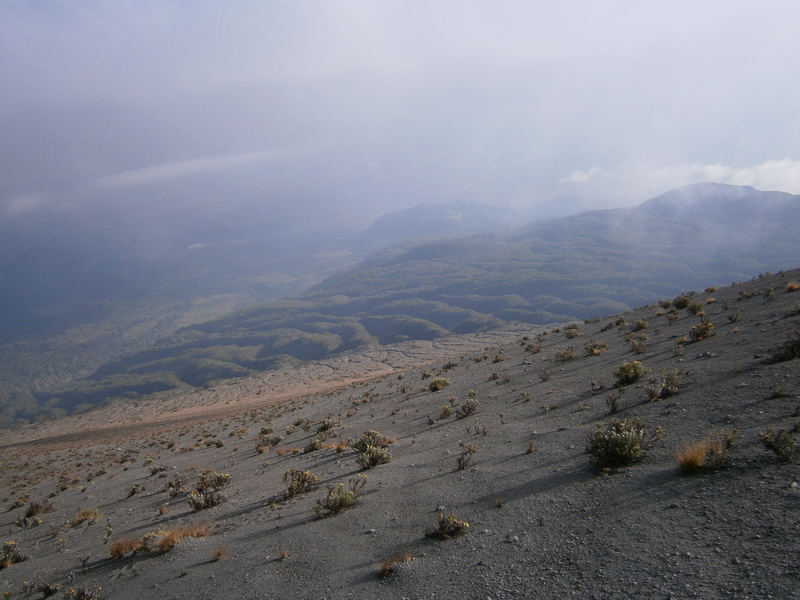 During descent the fog lifted, and provided great views of the volcanic ash cone in Meru’s crater. Meru is still considered to be an active volcano, and the large central ash cone is the result of minor activity. Back at Saddle Hut I packed up the remainder of my gear and began descending. The entire descent would be undertaken in one shot. On the way down, I opted to take the short route, avoiding the crater and passing through Meru’s lower grasslands instead. Here I was lucky enough to encounter some wildlife. 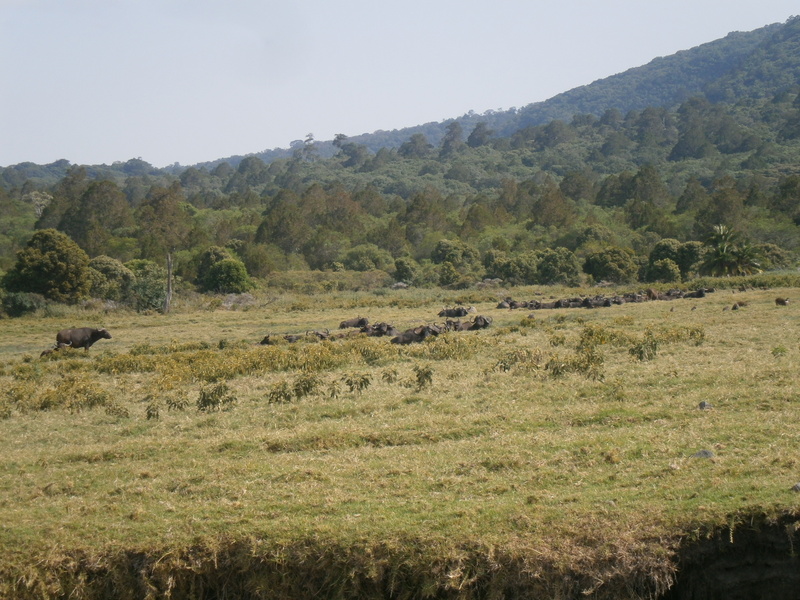 A large herd of buffalo, grazing on Meru’s lower slopes. Along with a big herd of buffalo was a family of five giraffes. The giraffes didn’t seem particularly surprised to see me. 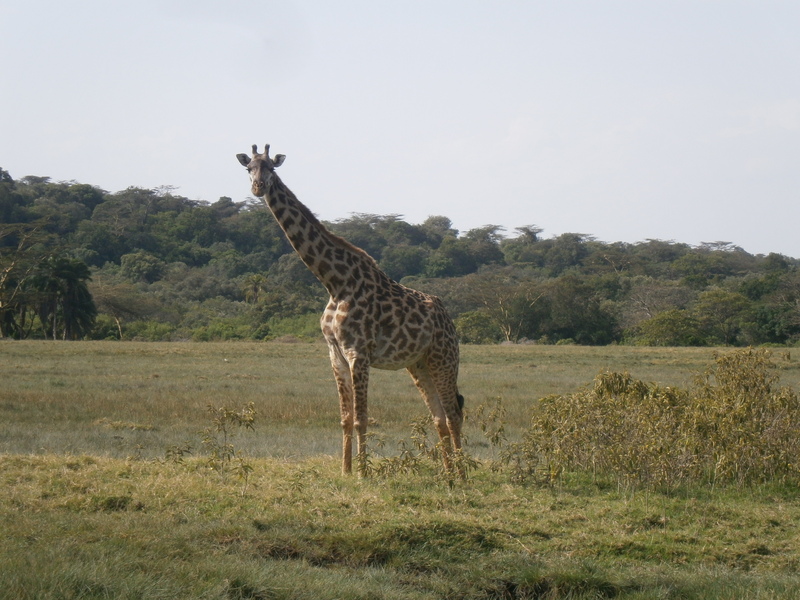 I was told that giraffes, and elephants as well, are a common sight on Meru, where they are protected from hunting. Back at the park gate I got one last view of Mount Meru, and got a ride back to Arusha with my hired driver. Mount Meru in the distance. All said and done, the hike was enjoyable enough, scenic if not particularly strenuous. As pre-acclimatization for Kilimanjaro, it served well. A different itinerary would have been more logical and more enjoyable. The summit definitely doesn’t require an overnight push, and would be far nicer in daylight, clear of morning fog. 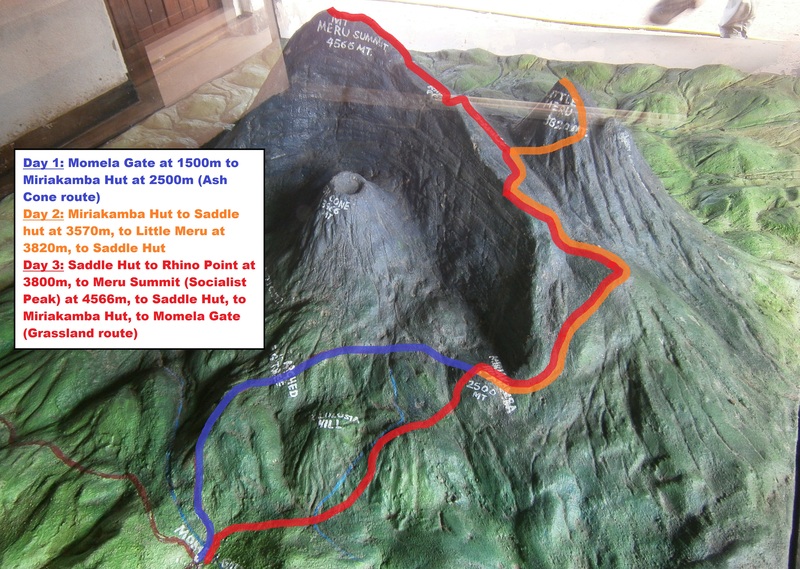 Hiking Mount Meru is fairly straightforward. Fees for cabin lodging are paid at the park, where a Ranger will be assigned to you. From Arusha, a driver can be hired at minimal cost. 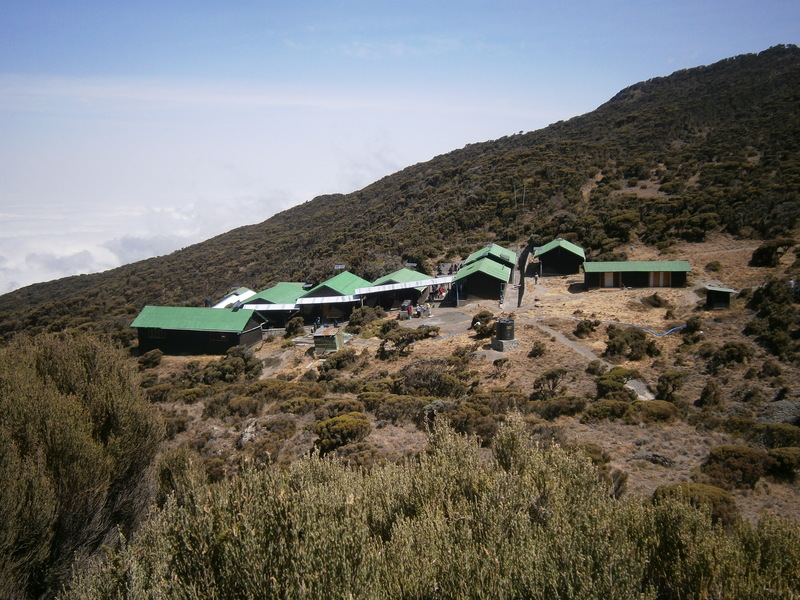 Most outfitter companies which provide services to Kilimanjaro also run hikes on Mount Meru, and can provide full-service with porters, cooks, and a guide. While the majority of hikers do seem to use porters, the hike is moderate enough that it is unnecessary. 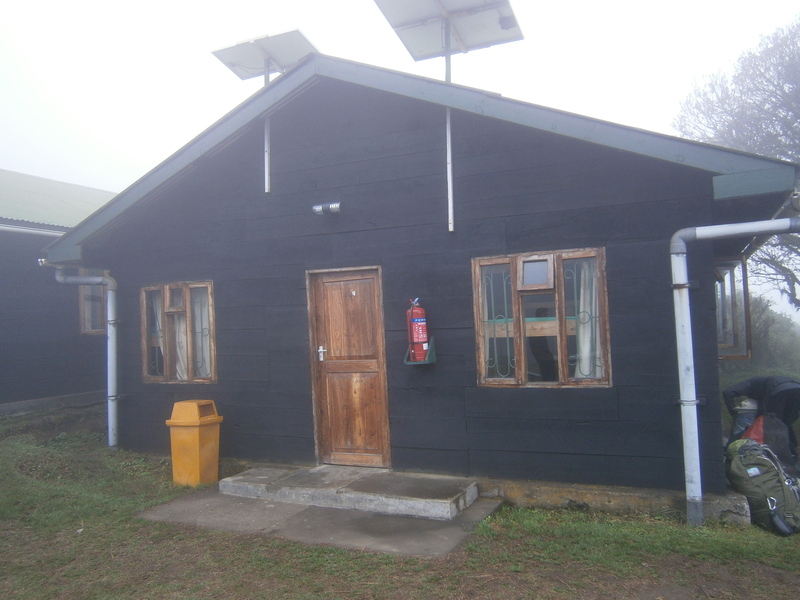 Each cabin has a stable water source, and a light pack can easily be managed due to the indoor lodging. My pack weighed less than 15kg, with a liberal amount of extra food. 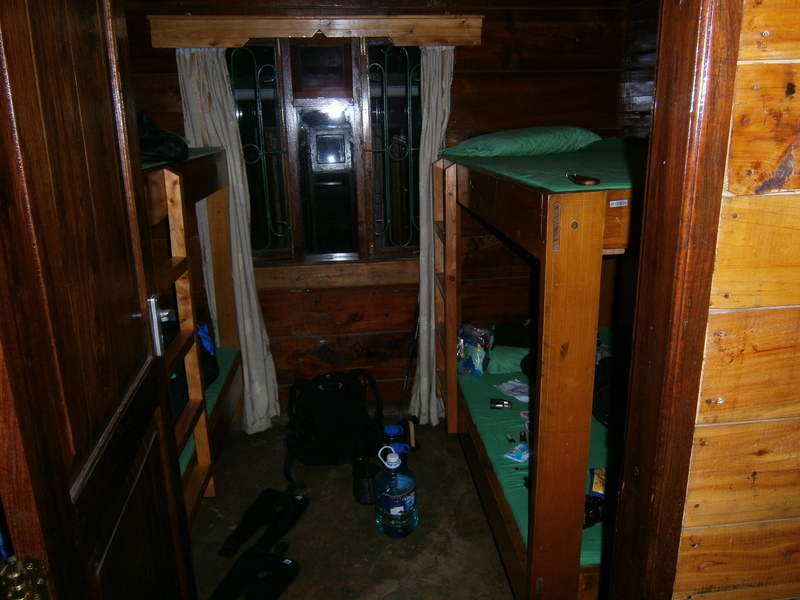 The dormitory rooms are comfortable enough, and have locking doors for storing spare gear. A good amount of information exists on hiking Meru, and many of the outfitter websites also incorporate detailed planning information. 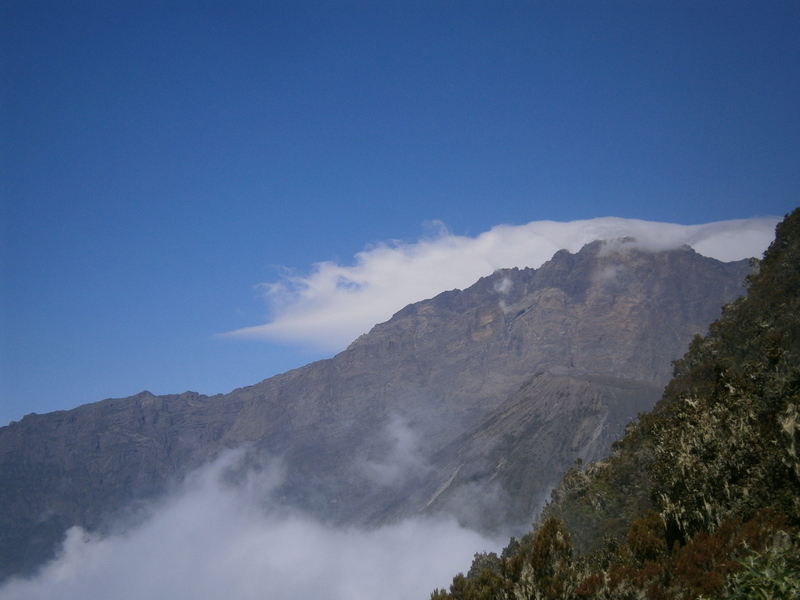 This entry was posted in Hiking, Tanzania and tagged Kilimanjaro, Little Meru, mount meru, Tanzania by Ian. Bookmark the permalink.